Yams are carbohydrate rich, staple tuber vegetables of West African origin. Botanically it belongs to the family Dioscoreaceae, in the genus, Dioscorea. There exist several hundred cultivars of Dioscorea; however, only a few of them worth of commercial importance. Traditional yam tuber types grown are Dioscorea rotundata (white guinea), D. alata (yellow), D. bulbifera (aerial potato), D. opposita (Chinese), D. esculenta (Southeast Asian) and D. dumenterum (trifoliate). Besides their use as food, yams have long been symbolically associated with the culture and ritualism in some parts of Africa, Asia, and Latin Americas. Chinese mountain yams (D. opposita). Photo courtesy: Soo Hua Tung. Yam plant is a perennial vine cultivated for its large, edible, underground tuber, which can reach up to 120 pounds in weight and 2 meters in length. They are one of the conventional tropical crops requiring hot, humid climates and may cease to grow when the temperature dips below 68 degrees F.
Yams are similar in appearance to sweet potatoes. However, they are not at all related to it. Some major differences that set them apart from sweet potatoes: yams are monocotyledons, larger in size, features thick, rough, dark brown to pink skin depending upon the cultivar type. Whereas, sweet potatoes (Ipomoea batatas) are dicotyledonous, relatively smaller size and possess thin peel. Although yams are grown all over the African continent, Nigeria is the world’s largest producer and exporter, accounting for over 70 percent of the total global production. Yam is a good source of energy; 100 g provides 118 calories. It's crunchy edible root chiefly composed of complex carbohydrates and soluble dietary fiber. Dietary fiber help reduces constipation, decrease bad (LDL) cholesterol levels by binding to it in the intestines and lower colon cancer risk by preventing toxic compounds in the food from adhering to the colon mucosa. Additionally, being a good source of complex carbohydrate, it regulates steady rise in blood sugar levels. For the same reason, yam recommended as low glycemic index healthy food. The tuber is an excellent source of the B-complex group of vitamins. It provides adequate daily requirements of pyridoxine (vitamin B6), thiamin (vitamin B1), riboflavin, folates, pantothenic acid, and niacin. These vitamins mediate various metabolic functions in the body. Fresh root also contains good amounts of antioxidant vitamin, vitamin-C; providing about 29% of recommended levels per 100 g. Vitamin-C plays some important roles as anti-aging, immune function booster, wound healing, and bone growth. Yam contains small amounts of vitamin-A, and β-carotene levels. Carotenes convert into vitamin-A inside the body. Both these compounds are powerful antioxidants. Vitamin-A has many functions like maintaining healthy mucosa and skin, night vision, growth and protection from lung and oral cavity cancers. Further, the tuber indeed is one of the good sources of minerals such as copper, calcium, potassium, iron, manganese, and phosphorus. 100 g provides about 816 mg of Potassium. Potassium is an important component of cell and body fluids which helps controlling heart rate and blood pressure by countering hypertensive effects of sodium. Copper is essential for the production of red blood cells. The body uses manganese as a co-factor for the antioxidant enzyme, superoxide dismutase. Iron is required for red blood cell formation. Yams can be available in the markets year-round. Fresh tubers, however, available in plenty by August when their annual harvest season begins, marking the end of the rainy season in Western Africa. A new yam festival celebrated with great fervor as symbolism to fresh crop and availability of fresh food in abundance all over Nigeria and Ghana. In the supermarkets, generally one can come across, small cut sections of yam wrapped in thin plastic films. Their interior meat is white to light pink depending upon the cultivar type with rich, starchy flavor. In general, whole tubers stored after drying several hours under the sunlight, in well-ventilated yam barns (traditional storage system) where they stay well for several months. Cut sections, however, should be used early or stored in the refrigerator for immediate use. Unlike sweet potatoes which can be eaten raw, yams should never be consumed uncooked since they carry naturally-occurring plant toxins including dioscorine, diosgenin, and triterpenes. The tuber must be peeled and cooked in order to remove these bitter proteins. Dioscorea opposita or Japanese yam is, however, can be eaten raw, unlike its African brethren. Here, the whole root is briefly soaked in the vinegar-water solution to neutralize irritant oxalate crystals that found in their skin. The root is then cut into small slices or grated to get a gel-like milk to add in mouth-watering East-Asian recipes. The tuber can be used in a variety of cuisines boiled, baked, fried, or sometimes roasted. The most common cooking method in Africa is "pounded yam." Fufu (Foo-foo, Foufou) is a special dish prepared during the yam festival. To make fufu; either pounded yam or its powder is added to boiling water to make a round cake-like dough (clump). A bite-sized piece of the fufu is then consumed with sauce, stew, or soup akin to ragi cake (finger-millet, Eleusine coracana, ragi-mudde) eaten in some parts of South India. 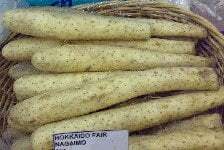 Japanese yam or yamaimo is eaten raw in salads or grated to get a gel-like milk, which is then added to noodles. It also used much like sweet potatoes in the preparation of cake, casseroles, bread, etc. Yam tubers used various traditional medicines in China, Korea, and Japan. Its mucilaginous tuber milk contains allantoin, a cell-proliferate that speeds up the healing process when applied to ulcers, boils, and abscesses. Its decoction also used to stimulate appetite and to relieve bronchial irritation, cough, etc. (Medical disclaimer). Yams of African species must be cooked before safely eaten because various natural toxic substances such as dioscorine can cause illness if consumed raw. (Medical disclaimer). <<-Read Sweet potatoes nutrition facts and health benefits. <<-Back to Vegetables from Yams. Visit here for an impressive list of vegetables with complete illustrations of their nutrition facts and health benefits.